The Bible explains that every good gift comes from God (James 1:17). Music is one of God’s good gifts. God has given both man and angels the gift of music-making (Genesis 4:21; Job 38:7). The purpose of music and singing is to rejoice in and worship the Lord (Psalm 95:1-2). The Lord created the powerful gift of music and He has given us voices to praise and worship Him with. 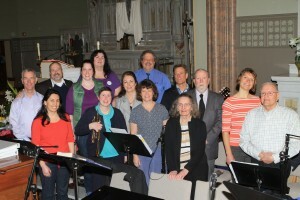 The Music Ministry spreads the Word of God through music experiences. The purpose of the Music Ministry is to share the gospel of Jesus Christ through song, encourage believers in their walk with Christ. Will You Sing Unto the Lord? The Music Ministry is open to all parishioners. It is composed of parishioners who have the desire to sing and worship the Lord. If you play a musical instrument and would like to use your talent for the Lord, Saint Patrick Catholic Church has a place for you. The Music Ministry provides an avenue through which individuals may share their gift and be an integral part of the worship. I want to spread the Gospel through music!